Even though electric buses – popularly known as trolleybuses – are an iconic part of many cities around the world, they have usually kept a low profile and the general awareness about their substantial economic and ecologic advantages is limited. In order to give electric buses their due recognition, the EU-backed project “TROLLEY” has initiated numerous activities to promote the attractive features of e-buses. For the 4th consecutive year, the European Trolley Bus day will be celebrated as part of the wider European Mobility Week. In 27 different cities around Europe, the municipal operators of trolleybuses will host entertaining events in order to engage the public and showcase trolleybuses as important contributors to clean, green and affordable urban transportation. The participating cities will attractively showcase their trolleybus fleets and present educational information in the form of creative posters, flyers and swingcards, which will get displayed in the interior of the buses. Balloons, t-shirts and cardboard models will also be handed out to children. 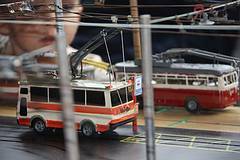 The German city of Solingen is combining the European Trolleybus Day events with Universal Children’s Day and all kids will have the opportunity to ride for free. In the Dutch city of Arnhem clowns and magicians will enchant the local visitors, while a bus simulator will make it possible for adults to experience first-hand the thrill and challenge of steering a trolleybus through a bustling city center. In Salzburg, Austria, a village festival in Hallwang will focus on the theme of “Trolleybuses in the Suburbs”. Additionally the city of Salzburg intends to thank all trolleybus passengers with various banners featuring the statement: “Thank you for helping us save 51 000 tons of CO2 emissions each year and reducing traffic by riding on our trolleybuses.” As a special gesture, a Salzburg trolleybus will be dispatched to the Czech Republic as a rolling ambassador. The following 27 cities are participating in the European Trolleybus Day 2013 and represent the motto "Green, clean, clever! ": Salzburg (Austria), Parma (Italy), Szeged, Debrecen (Hungary), Brno, Plzeň, České Budějovice (Czech Republic), Gdynia, Lublin, Tychy (Poland), Timișoara, Mediaș, Dumbrava Roşie (Romania), Solingen, Eberswalde, Esslingen, Leipzig (Germany), Kaunas (Lithuania), Landskrona (Sweden), Žilina (Slovakia), Bergen (Norway), Arnhem (Netherlands), Leeds , Sandtoft (United Kingdom), Limoges (France), Castellón (Spain) and Bishkek (Kyrgyzstan).